ROCHESTER, NY (WXXI) – It was a road show of sorts, in downtown Rochester on Wednesday. 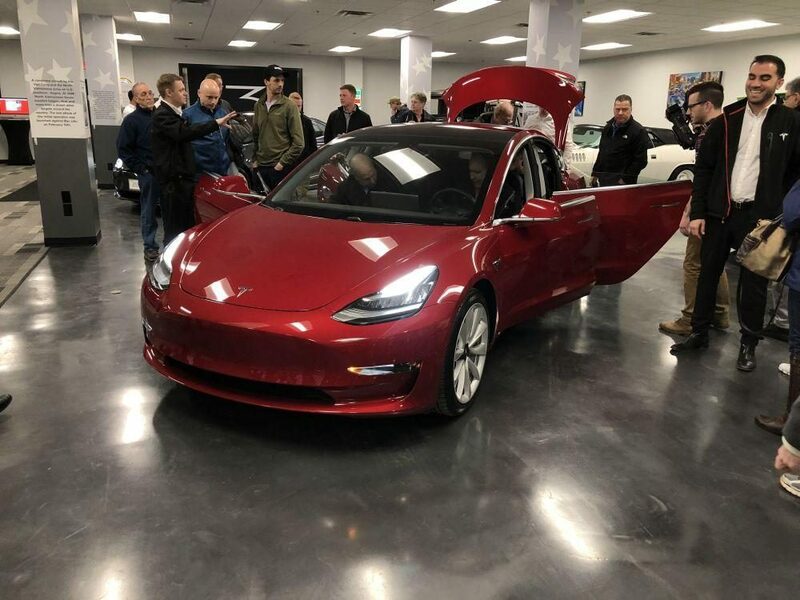 Tesla, the maker of high-tech electric vehicles, brought a few of its cars to the Rochester Auto Museum on Main Street, including the new, lower priced Model 3. Besides showing off the vehicles, company officials like Will Nicholas, a senior manager for policy and business development, is also trying to drum up support for getting more Tesla dealerships located around the state. Currently there are only 5 Tesla dealerships, all downstate, because the company sells direct to consumers and there is a New York State law that requires car sales go through auto dealers. Nicholas says there has been a lot of demand for the new Model 3. Tesla is pushing for a change in the law that would allow it to add 15 more locations in New York State, with five of those new locations in Upstate New York, including one in Rochester. The president of the Rochester Auto Dealers Association, Brad McAreavy says that if Tesla wants to expand, they should do it by selling cars through franchise dealerships, like other automakers. He says the auto dealers feel consumers are better protected , both in terms of getting better pricing, and service, when cars are sold through dealers rather than direct from the manufacturer. McAreavy says Tesla might even do better with sales if they sold their cars through dealerships, like other automakers do. “We think they’d be much better served, putting the vehicles in a dealership where it has full sales and service facilities and the customer would be able to come there, drive the car, get their car serviced, etc. So, if they were willing to work with dealers and give them the franchise, we think they’d actually be more successful,” McAreavey said. State Assembly Majority Leader Joe Morelle, a Democrat from Irondequoit, has pushed for legislation that would allow Tesla to build more stores as long as they include more stores upstate and that those stores offer maintenance and repair services.